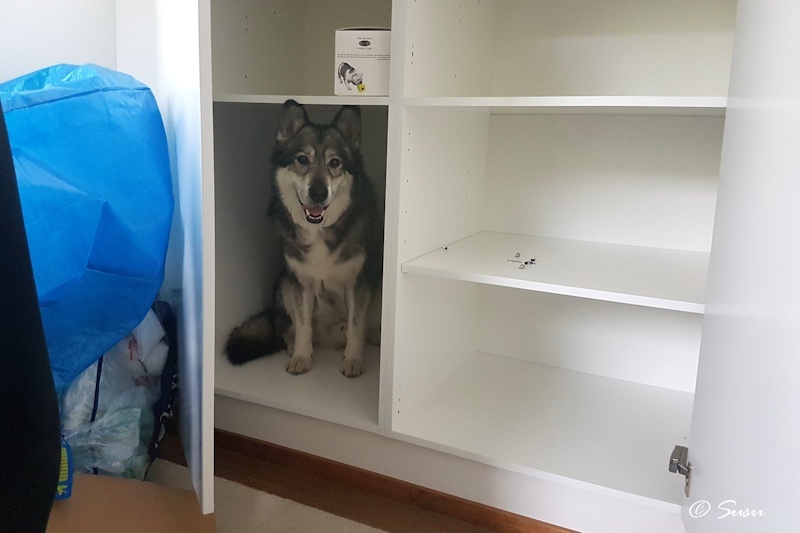 When you are moving with your dog it’s essential to prep him beforehand. Many dogs tend to stress when there are changes in their lives. Some dogs may not show strong stress signals or some dog owners might miss those subtle signs. You can learn about subtle calming signals that are related to dogs’ stress in here. Miki is no exception and he usually get stressed about everything. 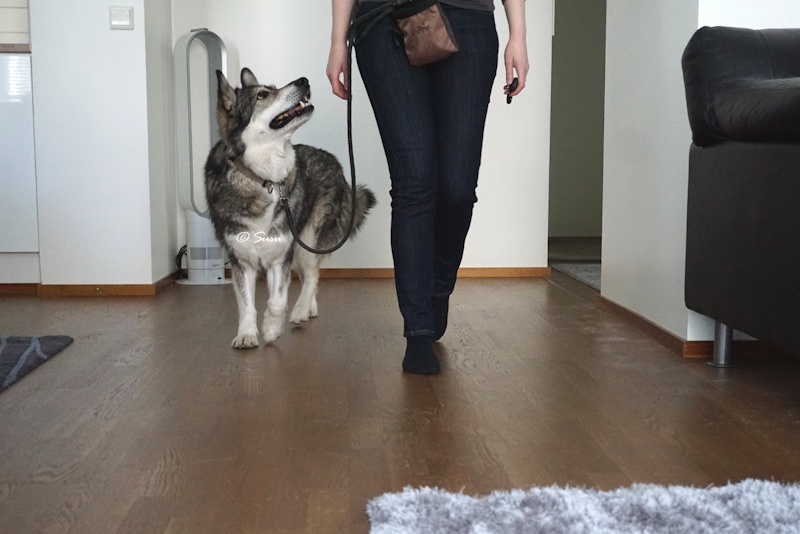 I’m writing this post because we just moved and I wanted to share my experiences about moving with a dog. You can ease your dog’s stress quite a bit even with a small effort but it’s essential to start early. This was Miki’s first move. Actually, this was his second move because he lived with his breeder first eight weeks of his life. I knew it would be good thing for my new puppy if he could get something familiar with him from his breeder. We talked about this with the breeder beforehand and she promised to give piece of a blanket with him. This blanket was the one that all the puppies had slept on so I was very pleased. Miki would get the familiar scent from his litter with him and it would ease his yearning within the first night away from his mom. I was very surprised when we went to pick him up from the breeder. She gave me piece of that blanket as she had promised but she told us she had just washed the blanket before cutting it to pieces because it had been dirty. Oh no. She had just washed all the familiar scent off the blanket and as I predicted it didn’t bring any comfort to Miki as he whined through the first night with us yearning after his mom and siblings. I made a desicion that this time I would do everything I could to make this move as easy as possible for Miki. We have a new move coming in six months of time after this move so and I want things to go as smoothly as possible for the second time also. We started this prosess by listing our apartment. That also meant a thorough cleaning process for private views. This happened in the spring just when Miki was shedding like no tomorrow and that’s why we needed to vacuum and dust about 2 to 3 hours every day for three weeks because there was just SO MUCH fur everywhere. All that cleaning obviously took time from Miki’s walks and from our play sessions. Miki couldn’t understand this cleaning frenzy and he got stressed and he begun throwing up. Within all this frenzy we tried to hold on to Miki’s schedule and tried to feed and walk him at the same time every day as before. Miki’s upset tummy got better only after we sold the apartment and stopped the cleaning frenzy. If it’s possible I recommend that you take your dog to daycare to a familiar place for the day you’re moving. We haven’t ever gotten that choice because Miki is so strong dog and he’s reactive and that combination can lead to serious consequences. I then begun to practice two alternatives with Miki because at the time I didn’t know which way I should go. Alternative 1: Miki is with me the whole day we are moving. He’s leashed and the leash is attached to my waist. 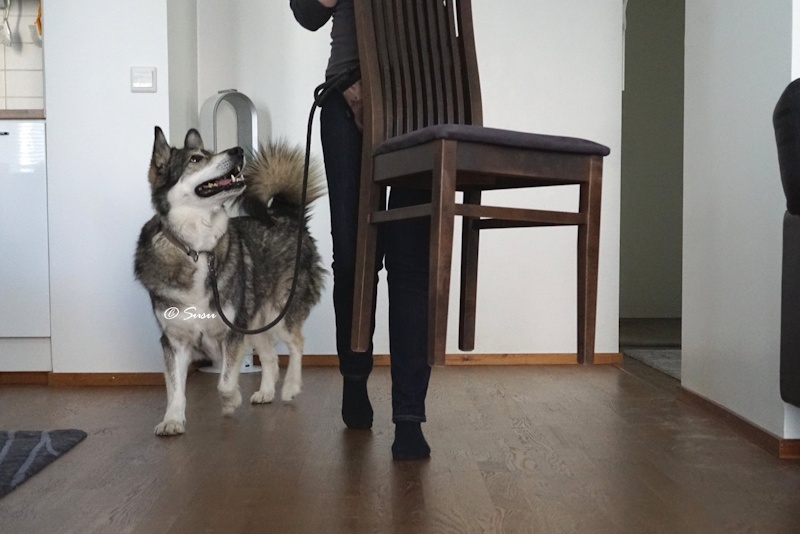 When I started training this, I put on Miki’s collar and leash and put the leash around my waist. It would’ve been essential to have him leashed because the doors would’ve been open the whole day. First I walked and Miki followed me by my side in contact and every now and then I changed my direction and rewarded Miki for following and consentrating on me calmly. When Miki understood this was the thing I wanted, I added more challenge. I changed my dirention towards Miki or reversed towards him and rewarded him for giving me some space. Then I started moving some small items simultaneously rewarding Miki when he followed and/or gave me space or stopped to wait for me to do something. Later on I moved some larger boxes and chairs from one room to another and rewarded him like before. We also practiced that my spouse carried stuff outside our apartment to the hallway and I rewarded Miki for staying calmly inside with me. Alternative 2: I take Miki to daycare to my mum on the morning we are moving and we move our stuff as quickly as possible so that I’m able to pick him up before he needs to go outside to do his business. I’ve had Miki with me many times I’ve visited my mum but I’d never before left him there without me being there with him. First time I took Miki there to practise this I froze him a Kong toy full of liver paté. When we arrived I gave Miki the toy straight away and left without saying anything. I was gone like 10 minutes and I came back when there was still something left in the Kong for Miki to lick. Next time I was away about 15 minutes and the time after that about an hour. Just remember that you always need to start with baby steps when you introduce something new to your dog. And please remember that leaving your dog in a hot car for the moving day isn’t option at all. Your dog can easily get a heat stroke and die. Dogs are intelligent species and they can pick up small cues to figure out what’s happening. Your dog adjusts to changes faster when there are things that are somewhat familiar to him. 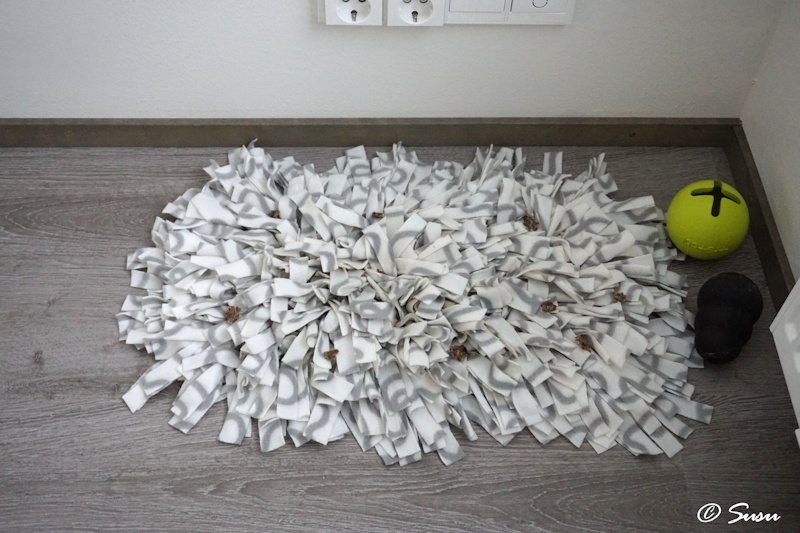 It might be a good idea to take some of your dog’s stuff like a bed or some toys to your new home before you bring your dog there for the first time. 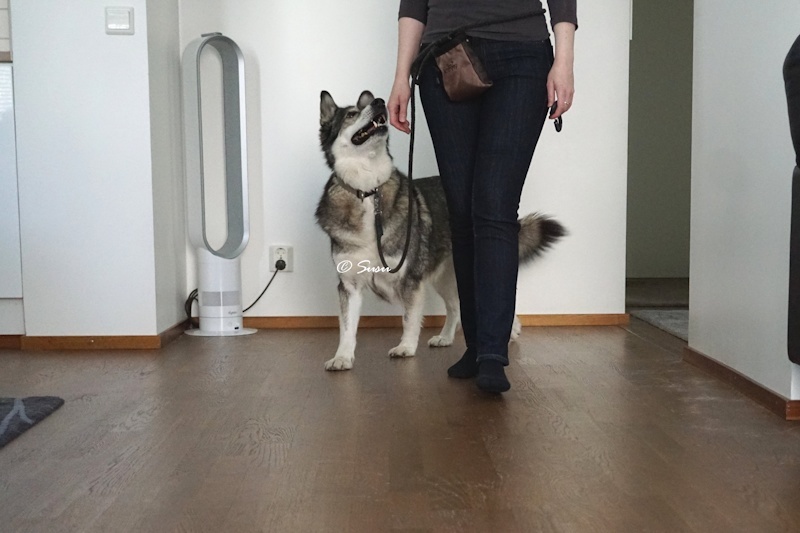 This way there are something familiar and your dog associates the new place with positive things. If it’s possible you should walk your dog before the first visit and even better if you can walk him in the new neighbourhood several times before the actual move. Although we are moving next time in about six months we have already taken Miki for walks into that new neighbourhood so that he would feel comfortable when we move there. New furniture can also stress your dog because they smell unfamiliar. If you are about to buy new furniture to your new home think if there’s a possibility that you could buy them already to your old home so your dog can get accustomed to them before you move. If it isn’t possible then think if it’s possible to take your old furniture with you and buy the new ones later when your dog has already get accustomed to your new home. If you need to move because of your work and your working hours changes simultaneously, think if it’s possible to change to this new daily schedule before you move. Then your dog would be able to adjust to this new routine beforehand. 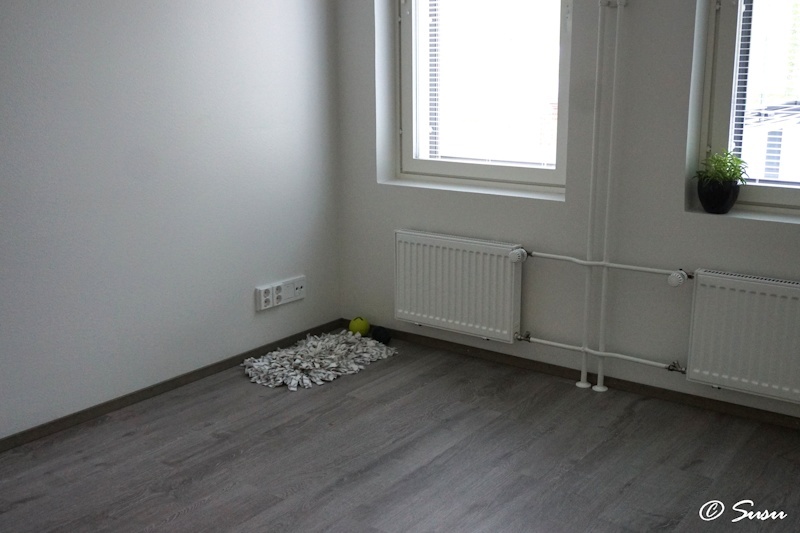 We cleaned our new apartment a day before we moved in. I left Miki’s fleece mat with lots of treats and some toys there so when I took Miki there for the first time his beloved things were already there waiting for him. If you have any issues with your dog (nail clipping, doorbell, a mailman or whatever) a move is a great opportunity to tackle the issues. The new setting (new home, new smells, new sounds, new surroundings etc.) allows you to start off from a clean slate. You can read more about desencitizing from here. Fortunately Miki hasn’t ever had any major issues. We do have some issues when we are drying him after a shower. Miki lets me dry him with a towel but he whines a lot so he’s not very pleased. I can’t dry a wet dog anywhere else but in the bathroom so my choice was to show the new bathroom in a different light to him after we moved. Miki has always suffered from mild separation anxiety and after we moved I noticed it got much worse. Although I planned everything beforehand and tried to make Miki feel as comfortable as possible in our new home, there are unfortunately things that I can’t control. There are lots of other dogs in our apartment building and the first day we moved in we heard many of those dogs barking - also in the middle of the night - and Miki got scared. Because Miki felt that the new surroundings were scary he got very anxious when even just one of us were about to leave home. Fortunately me and my fiance have an option to telework. If you have the same option and your dog suffers from separation anxiety you should use it to stay home with your dog even for a couple of days. If you don’t have that option, think if there’s a way to take a few days off. If your dog is scared and you have no choice but to leave him alone it’s always possible that the fear might get worse. To prevent that from happening I recommend that you leave him with a tasty and long lasting treat, like a bully stick or a frozen Kong toy and leave tv or radio on for ambient noise. We teleworked in turns every other day so Miki got the best chance to feel safe in our new home. The symptoms of separation anxiety started to ease after five days when Miki got the chance to get used to the new sounds with us.